Human ADP-ribose pyrophosphatase NUDT9 belongs to a superfamily of Nudix hydrolases that catabolize potentially toxic compounds in the cell. NUDT9 alpha protein is targeted highly specifically to mitochondria, whereas the predicted protein of the NUDT9 beta transcript, which is missing this sequence, exhibits no clear subcellular localization. Investigation of the physical and enzymatic properties of NUDT9 indicates that it is functional as a monomer, optimally active at near neutral pH, and that it requires divalent metal ions and an intact Nudix motif for enzymatic activity. 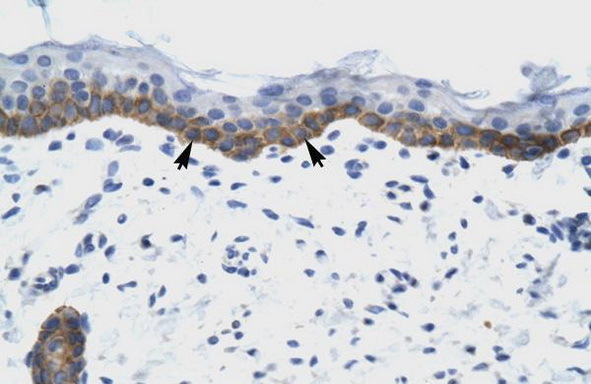 NUDT9 MaxPab polyclonal antibody. 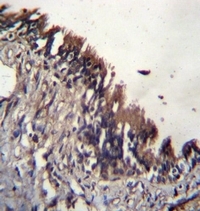 Western Blot analysis of NUDT9 expression in human liver. 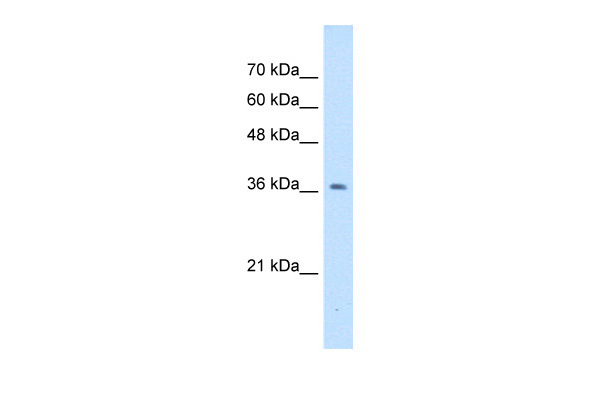 Western Blot analysis of NUDT9 expression in transfected 293T cell line (H00053343-T01) by NUDT9 MaxPab polyclonal antibody.Lane 1: NUDT9 transfected lysate(38.5 KDa).Lane 2: Non-transfected lysate. 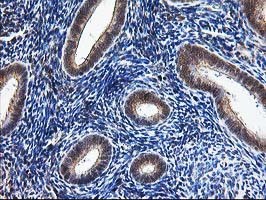 NUDT9 MaxPab polyclonal antibody. 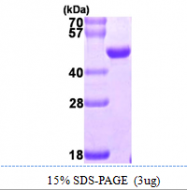 Western Blot analysis of NUDT9 expression in A-431. 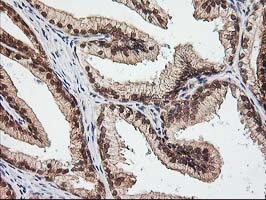 NUDT9 MaxPab polyclonal antibody. 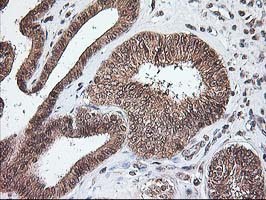 Western Blot analysis of NUDT9 expression in HeLa. 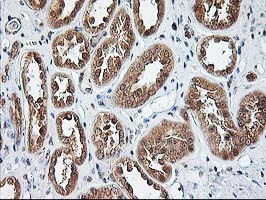 Immunohistochemistry analysis in formalin fixed and paraffin embedded human lung tissue reacted with NUDT9 / NUDT10 (C-term) Antibody Cat.-No AP52966PU-N followed by peroxidase conjugation of the secondary antibody and DAB staining. Western blot analysis of NUDT9 / NUDT10 (C-term) Antibody Cat.-No AP52966PU-N in mouse NIH-3T3 cell line lysates (35ug/lane). 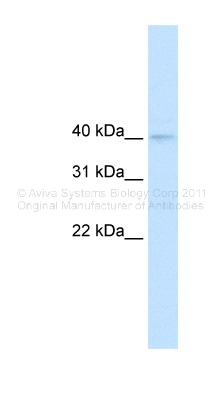 This demonstrates the NUDT9 antibody detected the NUDT9 protein (arrow). HEK293T cells were transfected with the pCMV6-ENTRY control (Left lane) or pCMV6-ENTRY NUDT9 (RC222894, Right lane) cDNA for 48 hrs and lysed. Equivalent amounts of cell lysates (5 ug per lane) were separated by SDS-PAGE and immunoblotted with anti-NUDT9. 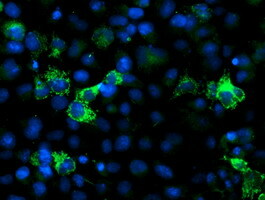 Anti-NUDT9 mouse monoclonal antibody (TA503333) immunofluorescent staining of COS7 cells transiently transfected by pCMV6-ENTRY NUDT9(RC222894). 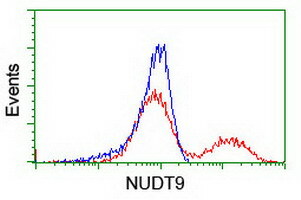 HEK293T cells transfected with either RC222894 overexpress plasmid(Red) or empty vector control plasmid(Blue) were immunostained by anti-NUDT9 antibody(TA503333), and then analyzed by flow cytometry.